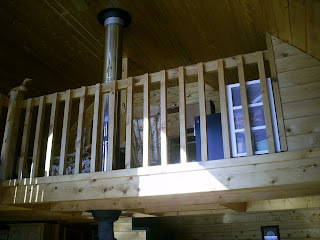 I said in a previous post (or Comments) that I would post some pictures of our loft where I scrapbook. Posted by Lisa at 1:58 p.m. I tried commenting yesterday, but blogger was acting up. You have a beautiful house. My beloved and I have always wanted a log cabin home. I hope you don't mind, but I will share your pictures with him. ;0) lol I wouldn't put curtains up either, I would just love to enjoy the view. I love all the sunlight coming in. 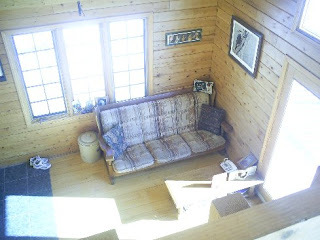 We get a lot of sunlight in our house as well, I love the cheeryness of it. 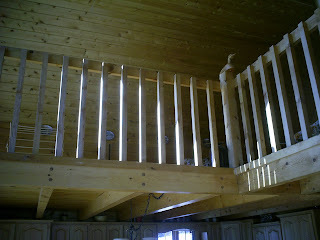 ;0) Your loft to do your scrapbooking, etc. is great. Thanks for sharing with us. March 23, 2007 at 10:09 a.m. Thanks for commenting on my blog. That's how I found your blog. I *love* your home! We are drawing up plans right now that look much like this! I think the windows are simply wonderful! You don't need curtains. Let the sun shine in!!! March 23, 2007 at 1:14 p.m.
March 23, 2007 at 2:46 p.m.
What a beautiful home you have! What a nice relaxing spot to do your scrapping! I look forward to having my own spot as well! March 29, 2007 at 8:54 a.m.